Rightly famous is Thomas Merton’s insight on the corner of Louisville and Walnut in Kentucky “…I was suddenly overwhelmed with the realisation that I loved all these people, that they were mine and I theirs.” The Cistercian monk who had fled what he saw as the corruption of the world, realised that he was profoundly linked to it. One of the deepest social afflictions of our times is loneliness. John Cacioppo, recently deceased professor of neuroscience at the University of Chicago, spent long years studying loneliness. He found whereas obesity could shorten life by 20 per cent, and alcoholism 30 per cent, for loneliness that figure rose to 45 per cent. Such loneliness is paradoxically sharper in a world where social media thrives. Skype or Facetime can deliver loved faces but accentuates loneliness because such presence is only virtual. These ghost images cannot reach out, yet their touch may be the more desired because it is so tantalisingly but falsely close. Those who enter religious life are a prophetic sign that loneliness can be transcended. Differing in ages and stages of life, social class and ethnicity, they are a testimony that love of Christ and others can melt the fears and suspicions that drive individuals and communities apart. Religious also demonstrate that aloneness is not loneliness. Unmarried, sometimes living at a distance from one another because of the nature of their work, they are sustained by bonds of love that can span continents. 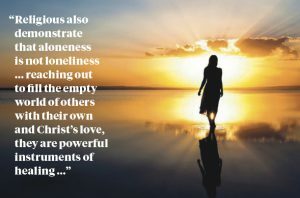 In reaching out to fill the empty world of others with their own and Christ’s love, they are powerful instruments of healing in a fragmented world.